"Little Cabiria....Her name recalls the spirit of the industrious flame, and Hestia smilesupon her from the hearth." 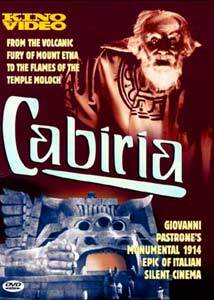 The 1914 Italian epic Cabiria was a hugely influential film, in more ways than one. Here wesee the grand operatic style come into full flower, aided by an increased vocabulary in film technique. A comparison with the Italian epic of 1913, The Last Days of Pompeii (reviewed on this site, and released by Kino on DVD on the same day as this disc) shows a great leap forward in filmmaking,to innovative cutting and camera movement. The massive sets, crowd scenes and battles ofCabiria helped convince D.W. Griffith to turn a run-of-the-mill social piece, The Motherand the Law, into the massive and unsurpassed creation Intolerance. One of theprincipal characters, Maciste the mighty slave, became so popular that an entire genre of Italian filmsgrew up around him (though usually revised to be Hercules in American releases). The story takes place in the third century B.C., against the backdrop of the Second Punic Warbetween Rome and Carthage. A little girl, Cabiria (Little Catena), lives with her parents and nurseCroessa (Gina Marangori) in a city at the foot of Mt. Etna. Almost immediately, director Pastronegrabs the audience by the throat with a spectacular sequence of Etna erupting and destroying the city. Cabiria and her nurse, along with other servants, escape the devastation but are promptly capturedby Phoenician pirates. Brought to Carthage, she is sold to the high priest, Karthalo (Dante Testa),for purposes of sacrifice to their bronze god, Moloch. Croessa finds a Roman (actually a spy),Fulvius Axilla (Umberto Mozzato), and convinces him and his muscleman slave, Maciste, to rescueher. They do so in a thrilling chase sequence, and eventually place her as a servant to theCarthaginian princess Sophonisba (Italia Manzini). As the war continues, complete with epic-scalebattle scenes, Cabiria grows up (and is then played by Letizia Quaranta), until she is recognized byKarthalo and returned to her duty as human sacrifice victim; meanwhile, Fulvius meets Cabiria'sparents and realizes that it was she they saved in Carthage, and amidst obstacles of every kind attemptsto rescue her before she is fed to the fiery Moloch. There is still a good deal of the old-fashioned tableau style visible in Cabiria; in these sequences a title card announces what is happening, and then it is played out in a single wide shot. Whereas Last Days of Pompeii relied almost exclusively on this static and stagebound style,Cabiria uses a great deal of intercutting to hold interest. There is also some cameramovement, although not a great deal. Dramatic lighting is used to excellent effect. Set design iswonderful, with massive-columned buildings (many of which come crashing down in the openingsequence) and the unforgettable Temple of Moloch. Shaped like some squat Meso-American deity, the temple serves as the entrance to the ever-hungry statue filled with flame where the sacrifices aredaily made. The "Moloch" scene in Fritz Lang's Metropolis (1926) is clearly makingreference to this dramatic scene. The acting style is not too alarmingly grandiose; although there is some posturing and overacting the cast, in general, uses a fair amount of subtlety. Especially good is a throwaway sequence with theengineer Archimedes developing weapons for the Carthaginians, including a "death ray" as thechapter titles would have it. This uncredited actor nicely conveys the efforts of the scientist with theglee at having solved a problem. Probably the biggest fault with Cabiria is the underdeveloped and essentially helpless natureof the title character. As a child, she is nothing but a victim of fate and circumstance, and as a near-adult does nothing whatsoever to win her own freedom or to contribute in any way to the story. More than anything, she is simply used as a focal point around which the interesting characters,Fulvius, Maciste and Sophonisba, rotate. The film was intended to be a literary event in 1914; as such, Italy's foremost living poet, Gabrieledi Annunzio was hired to write the intertitles for the film. The producers let it be known (falsely) thatdi Annunzio had written the story itself; however, his involvement occurred after all shooting hadbeen completed. The titles, as befits a poet, tend to be rather wordy and obtuse at times. This filmincludes some of the longest intertitles I've ever seen in a silent film, but generally they remain on thescreen long enough to at least permit fast readers to make it through. The original 1914 score is adapted here for piano and is quite effective. Most of the score is byManlio Mazza, with the Temple of Moloch sequence scored as the "Symphony of Fire" byIldebrando Pizzotti. The score during the eruption sequence also borrows liberally from the Molochscore as well, with the shrieking descending 32nd note scales being echoed in both scenes. The film is presented in the 1990 restoration by Charles Affron of NYU. Although the notes indicatethat it has been seen in severely truncated versions over the years, and that all extantfootage is included here, we are frustratingly left in the dark as to how complete this version of theCabiria is. The film is presented at proper running speed. Image Transfer Review: Cabiria is presented in black and white; the absence of tinting is felt quite seriously in a number of scenes. Most notable of these are scenes which are declared to be at night in the intertitles, but whichare shot day-for-night and thus look as if they are taking place in mid-afternoon. A little blue tint would make these scenes seem not quite so out-of-place. Blacks are quite good, and minimal speckling and frame damage is visible throughout most of the film. The picture is almost never overly contrasted, with a nice range of greys present. In the first scenes, the left side of the picture seems slightly out of focus; perhaps this is the result of uneven shrinkage of the film over time. It appears that the picture may be misframed at times; when we first see Maciste, the top half of hishead is cut off the screen. This might have been intentional to emphasize his size, but it looks ratherpeculiar and doesn't feel quite right. Audio Transfer Review: The audio of the piano score is quite good. A few missed notes make their way through, but that's about the only complaint. Hiss is quite minimal and no extraneous noises are heard. The scoreis played with sensitivity and emotion by Jacque Gauthier. Extras Review: Not much. The film begins with about 2 minutes of production notes (not included in the runningtime above), and additional notes are also presented on the enclosed insert. The chaptering is quite inadequate for a film of this length; many chapters run ten minutes or more. An intriguing and historically essential film, given a decentpresentation. A highly watchable experience, recommended to anyone with an interest in earlyfilm.